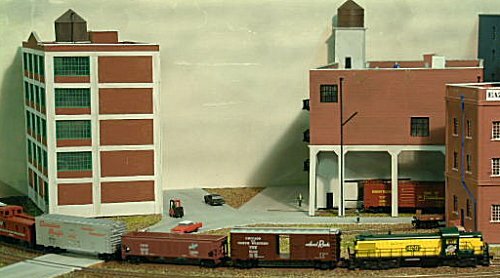 North Park is an N gauge American layout which portrays a version of the Chicago and North Western Railroad in the early 1960's. The trackplan is based on one seen in Model Railroader magazine and features a central divider with a rural scene on one side and an industrial area on the other. This produces a good deal of operating interest and I never tire of playing trains! The area of the layout is about 1 metre square and separates into two sections for transport. The baseboards are formed of plywood. Track is an assortment of offerings from Peco. The points are operated by slide switches via wire in tube. With the exception of the Bonner's Warehouse, all the buildings are scratchbuilt. Stock is a mixture from various manufacturers with Micro-Trains couplers added where necessary and operated by means of permanent magnets. North Park has been displayed at many local exhibitions and has the great advantage that it can be assembled and dismantled in about 15 minutes.